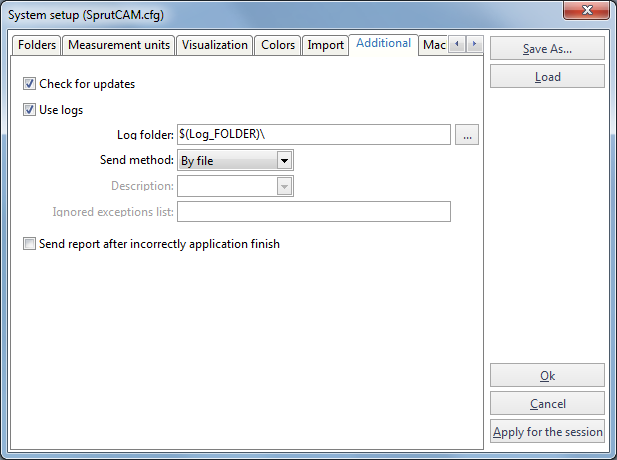 Use <Additionals> page to setup SprutCAM events logging and SprutCAM updating settings. Logs are useful when you encounter issues which are difficult to explain in words or which occur only when a specific consequence of actions is executed. To enable logging check the <Use logs> option. Enter the folder path in which you want SprutCAM to save the logs into the <Log folder> field. Choose the <By file> sending method to export the log into a file. This method is useful when the PC is not configured for networking and e-mailing. The default method is <By mail>. If you want SprutCAM to send error reports automatically check the <Send report after incorrectly application finish> option. To enable updates checking switch on <Check for updates> option.